We are very excited for our upcoming 2019/20 tryouts. Our tryouts will be held May 3rd - 16th. 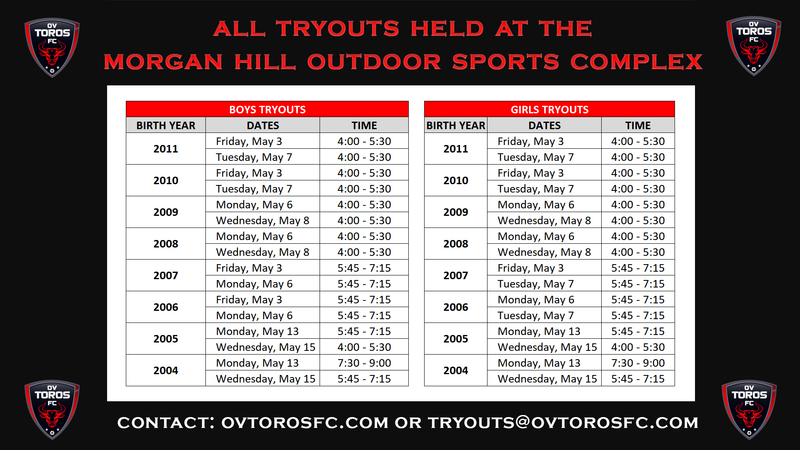 Each age group will have two tryout time slots and we encourage players to attend BOTH sessions. There may be some teams still playing spring league games after the tryout dates but this is out of our control due to the short season. Teams will not have practices during the tryout window, however players will still get plenty of touches at both tryout sessions. Informational Night to be held Monday, April 29th at the Holiday Inn Express in Morgan Hill. We will review tryouts in full detail along with pricing structure and philosophy of our club. We are asking all parents to attend and due to the size of the audience, please leave all players at home if possible. For those in the 2011 - 2008 teams the meeting will take place from 6:15 - 7:15pm. Additional state cup fees for all Black teams will also be charged. Details coming soon.